Here is a list of the officers for the Fraternal Year of 2018-2019 along with a brief description of their duty's. 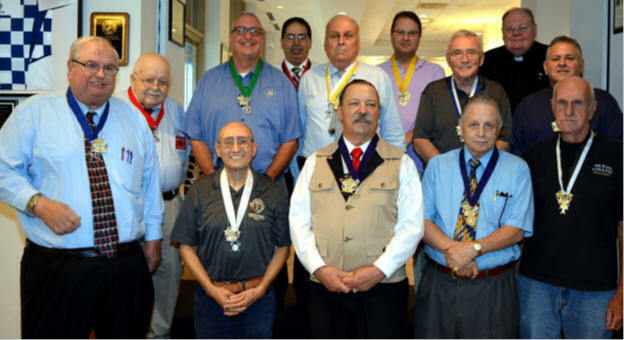 Treasurer; Sir Knight Wayne F. Bubak, Outside Guard; Sir Knight Phillip M. Riviera, Grand Knight; Sir Knight Dennis P. Fitzgerald, Deputy Grand Knight; Sir Knight Anthony J. Langone and Lecturer; Sir Knight Daniel R. McInerney. Warden; Sir Knight Michael A. Rodriguez, Advocate; Sir Knight Terry D. Cornell Jr. and Rev. Michael D. Class. The Recorder keeps the minutes of the meetings, conducts correspondence as directed by the Grand Knight, and keeps official historic documents of the Council. In the absence of the Grand Knight and Deputy Grand Knight, he presides at Council meetings. Crossed Quills hung from a white over yellow ribbon are symbolic of his responsibilities for letter and document (records) writing and preservation. His robe is black, trimmed with black, with a white cincture with silver fringe.